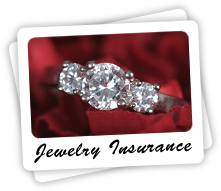 You Are Here:Home / Uncategorized / Is your Jewelry Covered by Homeowners Insurance? Homeowners insurance and renters insurance policies automatically include limited coverage for Jewelry (often $2500 – $5000 depending on the carrier). The important point to note, however, is that this coverage may not protect your jewelry if it is lost or misplaced, rather, it would only cover the items for specific causes of damage or theft. These causes of damage are the same as the causes of damage that your homeowners insurance protects you from like fire, water, wind, hail, etc. If you consider these causes of loss, you will realize that they are not the most likely perils that could affect your jewelry. If you are concerned with the potential loss of a piece of jewelry, or the potential of a precious stone falling out of a piece of jewelry, then it is extremely important that you list the item on your homeowners insurance or renters insurance policy. In order to do so, you would need to provide a bill of sale or appraisal on eh item to be sure that your independent insurance agent is insuring the item to the correct value. The premiums for this type of coverage are usually in the neighborhood of $15-$18 per $1,000 of coverage. To put that in to real numbers, a $10,000 piece of jewelry will most likely cost between $150 and $180 per year to insure. Here at the Smith Insurance Agency in Rochester, we have dozens of insurance carriers who will add jewelry coverage to your homeowners or renters policies. Some of them even include “mysterious disappearance” (in simple terms….”I lost it”) on their basic jewelry coverage without having to specifically schedule the item. Please call one of our agents or contact us on the web to discuss how we can help you ensure that your jewelry is protected!